Now at 108 Contemporary: "Both Sides Now: Joyce J. Scott & Sonya Clark"
Aired on Friday, August 4th. On this edition of StudioTulsa, we learn about a new exhibition (which opens this evening, the 4th) at the 108 Contemporary Gallery in downtown Tulsa. "Both Sides Now: Joyce J. Scott & Sonya Clark" will be on view through September 24th. Scott is our guest on the program today. And the exhibit in which she's co-featured is thus described at the 108 website: "Through the use of glass, beadwork, and fiber, 2016 MacArthur Fellow Joyce J. Scott and Sonya Clark highlight, challenge, and uncover racial representation and injustice. This exhibition weaves together the voices of these two internationally acclaimed artists and conveys a path towards understanding." On this installment of ST, we learn about the Tulsa Artist Fellowship, or TAF, which was established last year by the George Kaiser Family Foundation to both enrich and expand the local art scene by recruiting artists from all over the nation to the Tulsa area. This fellowship, per its website, "provides an unrestricted stipend, free housing, and work-space in Tulsa, Oklahoma, to US Resident artists.... 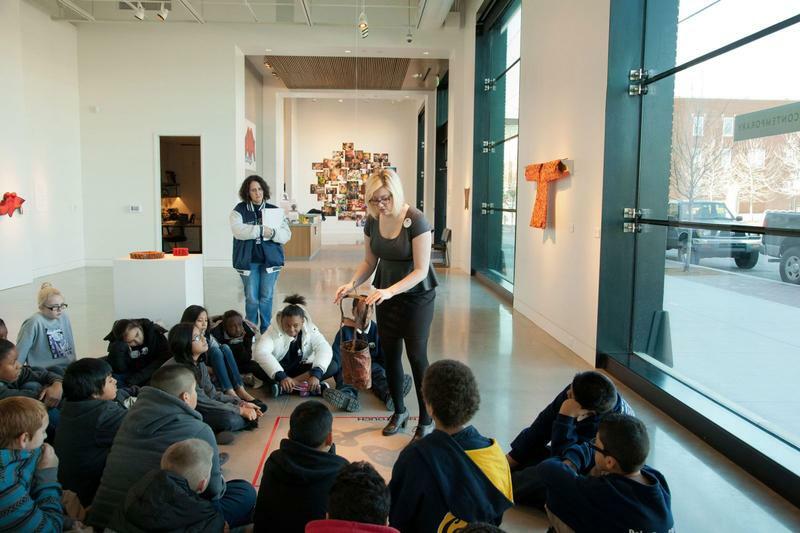 The Fellows are expected to integrate into the local arts community, such as [via] studio and collection visits. 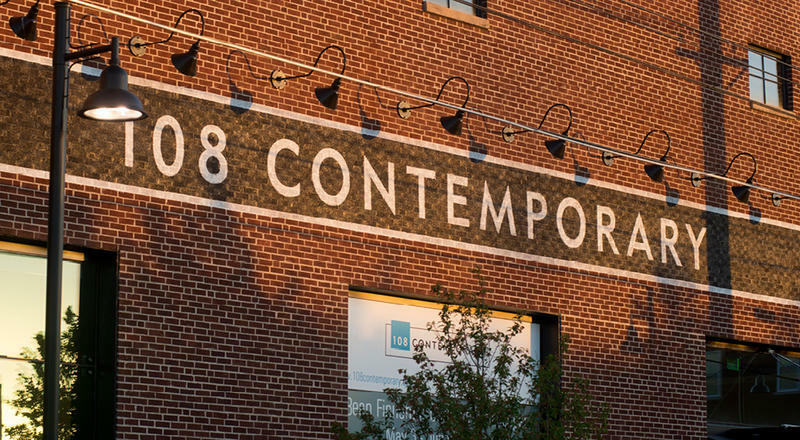 Have you noticed the enormous, vivid, and woven tapestry draping the entire front facade of the 108 Contemporary gallery in downtown Tulsa? It's an installation that's been hanging for a few weeks now, and it's entitled "The Unbearable Absence of Landscape." 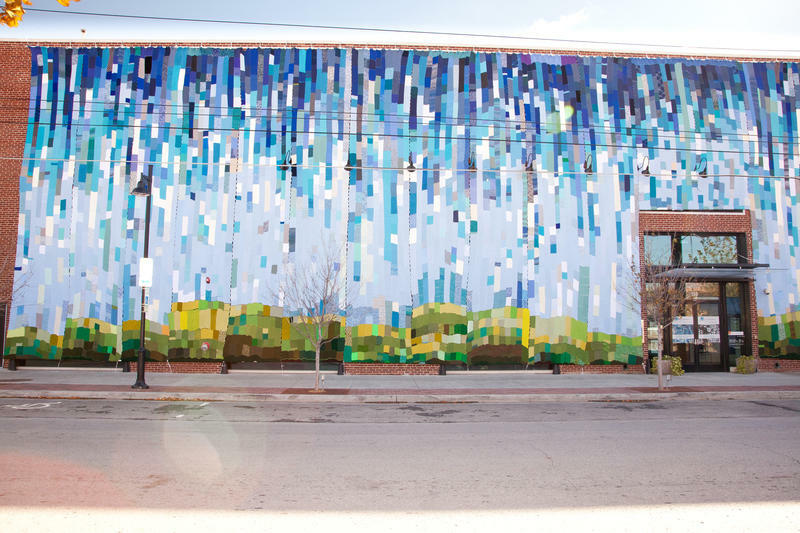 This vast piece -- made of panels created by hundreds of knitters all over the state with plastic yarn that, if unraveled, would stretch over 160 miles -- will have its official opening tonight (the 4th) at 6pm at 108 Contemporary as part of the First Friday Art Crawl in the Brady Arts District. 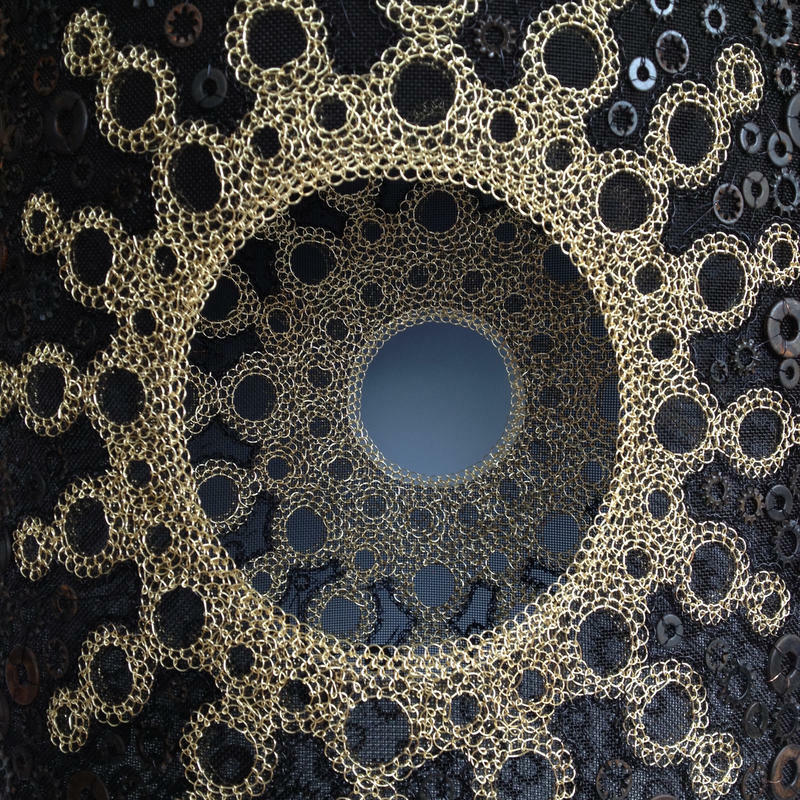 On this edition of ST, we speak with Lindsay Ketterer Gates, a Pennsylvania-based fiber artist who creates, as noted at her website, "slightly obsessive mixed-media work [that] springs from a background in and love of fiber techniques combined with a curiosity for all things purchased in bulk. Now on View at 108 Contemporary in the Brady Arts District: "Innovators and Legends"
The 108 Contemporary gallery in the Brady Arts District in downtown Tulsa opened a new exhibit this past weekend that focuses on the growth and development of fiber art in America from roughly the 1950s onward. The show -- called "Innovators and Legends" -- runs through March 22nd. Our guest on ST is the curator for this exhibit, Geary Jones, who is himself a well-regarded fiber artist. On today's show, we're discussing an interesting new exhibition that recently opened at the 108 Contemporary Gallery in Tulsa's Brady Arts District: "Twists and Turns" will be on display through October 26th. 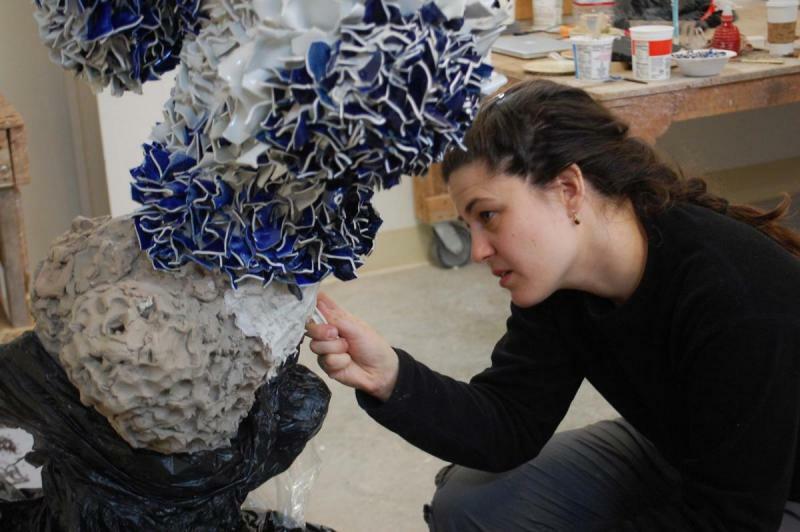 It's a craft exhibit of tapestries and ceramics that pairs -- for the first time ever -- two Israeli artists, Aleksandra Stoyanov and Zemer Peled, and it's actually the first "stop" in what will be a national tour for this show.